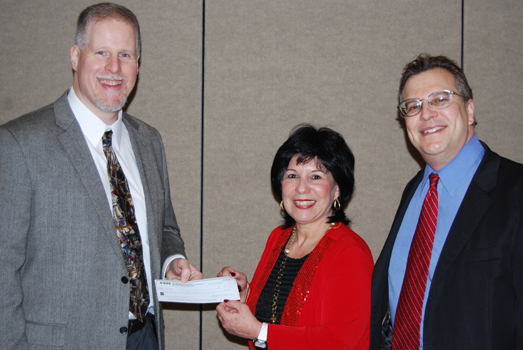 John G. Schmidt (left), Chairman of the IEEE Long Island Section, presents Joani Madarash (center), Executive Director, School-Business Partnerships of Long Island Inc., (SBPLI) and Chris Early (right), a member of the SBPLI Executive Management Team and an IEEE member, with a $1,000 check to benefit SBPLI programs on February 26. On February 26, School-Business Partnerships of Long Island, Inc. (SBPLI) was presented with a check for the amount of $1,000 from the Institute of Electrical and Electronics Engineers (IEEE) to support the organization's many educational programs, such as the upcoming Long Island Regional FIRST Robotics Competition (FRC) to be held at Hofstra University March 27-29th. IEEE is the world's largest technical professional society. It is dedicated to supporting the development of technological excellence for the benefit of humanity around the globe. Members of IEEE encourage a technological global community of highly cited publications, conferences, technology standards, and professional educational activities. "We cannot thank IEEE enough for their generosity," says Joani Madarash, Executive Director, School-Business Partnerships of Long Island, Inc. "We are so grateful for their donation to help support our programs. The IEEE is an excellent organization and we look forward to joint initiatives in the future."